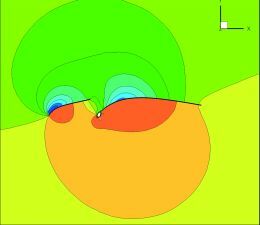 In the first part of this article, the complexity of the structural computer analysis of a mainsail model was discussed. The sail is constructed by joining a number of patches which are to be glued or sewn together; each patch presents a different warp orientation and the elastic properties may present some degree of discontinuities at the junctions. Moreover, though the sail fabric is very thin, often much thinner than 1 millimeter, near the head and the foot, and particularly near the clew, many layers of fabric are placed one upon the other, locally increasing the sail thickness and so modifying the global elastic properties. The set up of the structural model should also take into account the presence of sheets, along the luff and the leech, which are used to apply additional and arbitrary tension forces on the sail. 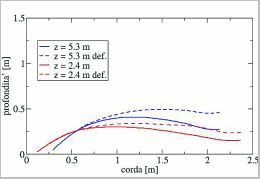 Finally, seams and sticking introduce discountinuities in the elastic properties, respectively decreasing and increasing the overall sail stiffness. The main task of the engineer is to gain control on all of the errors introduced by the approximations, and to be able to provide a reliable description of the structural problem, with an appropriate range of confidence. 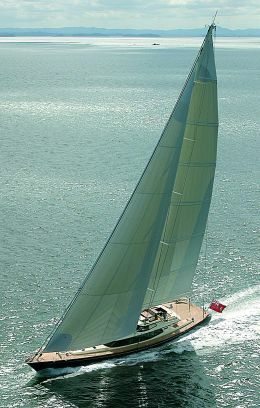 In the second part of the article some examples of computer solution are presented for the mainsail of a Tornado Olympic Class Catamaran designed by Andrea Mura Sail loft. The computer models of the mainsail carry simplifications and approximations, for the objective of these preliminary analysis is to verify the sensitivity of the solution, in terms of deformations induced by a known pressure distribution, on a few parameters that characterize the real engineering problem. The Figure 1 shows the aerodynamic load on the mainsail (units are Pascal, or Newton per square meter). 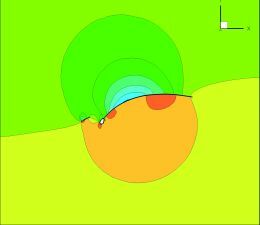 The pressure distribution is obtained with Computational Fluid Dynamic simulation and refers to a close-hauled case with an apparent wind angle of about 22 degrees and a wind speed of about 11 meters per second. The computer static analysis of membranes with very small thickness may produce numerical instabilities and may easily generate solutions with unphysical displacements, up to several tens of meters! The sail deformations due to a given pressure load are obtained with a non linear static analysis. The non linearity is geometrical and it used whenever the load may determine large deformations, capable of modifying to a large extent the initial geometrical configuration. In such an approach the load is applied in a number of steps. This procedure is well described in the technical and scientific literature, where most of the works on this subject make use of one-miilimeter sail thickness. It is not clear whether this value represents the real thickness under investigation, or just a sort of limit to prevent numerical instabilities. For the Tornado Catamaran mainsail, the thickness of the Cruising Laminate is about 0.2 millimeters, and certainly well below the one-millimeter limit. The Figure 2 shows the deformation of a one-millimeter thickness sail. The black lines represent the initial, not deformed configuration. The Figure 3 refers to a 0.4-millimeter sail, and shows the displacements in the Y direction (orthogonal to the membrane surface). UY is the largest component of the displacement vector. Figure 6 - modification (deformation) of the mainsail profiles due to the aeroelastic effect. The chord length is showed on the x-axis, and the camber on the y-axis. The initial design profiles (solid lines) and the deformed profiles (dashed lines) refer to the section with maximum displacement (5.3 m) and to a lower section (2.4 m). The one-millimeter mainsail model has been used to evaluate the aeroelastic effect: the change in the aerodynamic performance due to the sail fabric deformation. Four steps of an iterative procedure have been carried out, where the aerodynamic and the structural problems are repeatedly solved one after the other until the changes between two successive steps, both in the material deformation and in the aerodynamic forces, become smaller than a predefined tolerance. 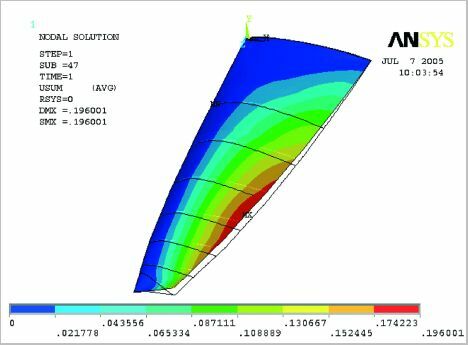 At each step the aerodynamic simulation is performed on a mainsail surface definition coming from the previous structural analysis. The thrust and the lateral force coefficients change from 0.30 and 1.45 at the beginning of the iterative process, to 0.29 and 1.24 at the end of the iterative process when the changes fall below 0.5%. The case presented show that the lateral force decreases due to the sail deformation, while the thrust force remains unchanged. The absolute value of the aerodynamic force diminishes, however gaining a few degrees in the direction of motion. So the sail deformation improves the aerodynamic performance. The aerodynamic overall forces are given by 3800 and 3300 Newton (corresponding to about 390 and 340 kg) respectively at the beginning and at the end of the aeroelastic coupling. The Figures 4 and 5 show the pressure fields and the pressure isolines at two horizontal sections at Z=2.4 m and Z=5.3 m respectively. At Z=5.3 m the maximum displacement occurs. The Figures 4a and 5a refer to the undeformed initial case, while the Figures 4b and 5b refer to pressure field determined by the aeroelastic effect. The traces of the jib and the mainsail are shown by the bold black lines. At both sections the effect of the decrease of the pressure difference between the two sides of the sails is clearly visible. This determines the decrease of the lateral force in the direction orthogonal to the motion (the vertical direction in the figures). The mainsail profiles at the two sections are shown in the Figure 6. In all cases the aerodynamic (CFD) simulations have been performed considering the complete sail rig, jib, mast and mainsail, though only the mainsail has been the object of the structural analysis. The force coefficients are calculated considering both contributions from the jib and the mainsail. The aeroelastic coupling presented only represents an example and the validity of the quantitative result is therefore limited by the approximations and simplifications of the model considered. In order to make the structural model of the mainsail more complex and closer to a real case, the effect of the material elastic properties on the deformation and so on the aerodynamic performance is considered. As already noted in the first part of this article, sail fabrics have orthotropic elastic properties, characterized by different properties in the two orthogonal direction of warp and fill. The elastic properties of the Criusing Laminate used by the Tornado Catamaran have been studied at the Department of Mechanical Engineering of the University of Cagliari. The resulting properties are: warp Young Modulus 2500 MPa, fill Young Modulus 1200 MPa, Poisson Coefficient 0.1745 and Shear Modulus 290 MPa. With these values two orthotropic sail models have been compared to a isotropic model with a unique Young Modulus of 2500 MPa for a 4-millimeter sail thickness. In the two orthotropic cases, the warp ribbons are orthogonal and parallel to the mast. The maximum displacement in the Y direction (orthogonal to the membrane) is 0.345, 0.504 and 0.470 meters, respectively for the isotropic case and for the two orthotropic cases. The difference in the maximum displacement between the two orthotropic models is about 7%. The average maximum displacement of the orthotropic case is 40% larger than provided by the isotropic model. These orthotropic models clearly do not represent the real sail case. It is likely in fact that the real maximum displacement will be closer to that of the isotropic model for, in the real case, the various patches of sail joint together, are assembled in order to locally place the warp ribbons in the direction of the maximum tension stress. Finally, the sail scheme shown in the Figure 7 represents a mainsail structural model configuration similar to a real configuration. It is made of 27 patches (blue) sewn together and 7 battens (black) for a total of 75 structural elements which may have independent warp orientation and a different thickness. Such a model, with a constant thickness of 0.4 millimeters, showed a resulting maximum displacement of 0.357, very close to the result of the isotropic case. The scheme of Figure 7 represents a structural model which contains many of the characterizations of a real mainsail: a patched sail with orthotropic properties. It can be used as the baseline model for considering variable thickness in order to take into account the placement of many fabric layers near the head and the clew. The Figure 8 shows the displacement field for a preliminary, though still rude, variable thickness model. The eight portions of the sail defined by the seven battens have been assigned a different thickness (from top to bottom: 3.6, 1.0, 0.7, 0.4, 0.2, 0.2, 0.7 e 1.5 millimeters). 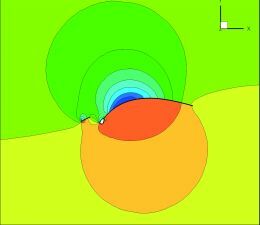 This is just a preliminary simulation, however it allows to programme the development of a realistic mainsail structural model usable by the engineers for the analysis and design.